Arminians use the term freewill to describe their view of men's decisions. I note that some Calvinists also claim that man has freewill. Their view they call compatibilism which I admit struggling to grasp. It seems to me that compatibilism is determinism with the claim that the person is also choosing this path. To distinguish such freedom oftentimes the term libertarian freewill is used. I take this to mean that a person can make a choice of their own accord. While a man may have several influences on his decision, such a choice is ultimately at the level of the person—his will, his decision making centre. The libertarian adjective is to identify that the decision is sourced in man, as opposed to a compatibilist claim that the man's decision is sourced in God. It does not mean that a man can make any decision whatsoever! Clearly it does not mean that a person can choose to fly. But nor does it necessarily mean that he make any choice that another person is potentially capable of. He cannot make decisions based on knowledge he does not have. If unredeemed man is unable to make decisions to follow God, he still can make a variety of decisions in rejecting him. And he can refrain from making some bad decisions. This falls under item #4 of my top 10 Calvinist annoyances. The extremes are that freewill is either essentially God's decision (compatibilist†) or man has the full capacity to make all and any good or bad decision. The middle position is that man has the power of contrary choice, though his decisions will be limited in capacity by various things. *Note that this does not mean that God is unable to force the person to do A. But in doing so God has removed their freewill. †I am not intending to misconstrue compatibilism. It is a Calvinist term and I am happy that they define it. Feel free to correct me. The sin which most consistently is said to bring down God's wrath on the heads of his people or on entire nations is idolatry—the de-godding of God. Orthodoxy is defined by means of a bounded set. Orthodoxy is the substance of right belief. A list of true statements. This is the nature of the creeds, and denominational confessions, and appropriately so given their intent. I do not think this type of definition carries over well to salvation. Sure God defines orthodoxy, and some of his thoughts can be rendered in propositional format, and believers in Jesus should align their minds with God's mind; but the nature of salvation is not propositional. Salvation is based on repentance and forgiveness. It is relational, we follow Christ. We leave the kingdom of the world and join the kingdom of God thru repentance. We stop following the world and we start following Jesus. Over time our minds should become aligned with God. What we think is true will become what God knows is true. However the penitent joins the kingdom with insufficient orthodoxy. What the man will believe differs markedly from what he currently believes. Catechismal classes attempt to address this, but the follower of Christ does not remain outside the set of saved men until he gains the appropriate measure of orthodoxy, nor is the orthodox man inside the salvation set if he refuses to follow our Lord. Orthodoxy is a bounded set, its definition depends on certain criteria, all of which need to be fulfilled. Salvation is a centred set, its definition depends on characteristics that describe the centre, and members are those which emulate this centre. To be clear, sets contain members that are inside them and outside them. A centred set may seem blurry though it is not intended to be. It is not that the definitions of centred sets are intrinsically unclear, they are different to bounded sets. The edges will seem blurry to those who who see salvation as bounded by orthodox belief, but that is because a bounded definition excludes and includes some men it should not. The salvation set itself excludes the unsaved. One is in the kingdom of God or he is not. But if we seek to establish who is in the kingdom by determining orthodoxy, we are asking a related but nevertheless incorrect question. Whereas if we ask who is following (the true) Jesus we will find the set contains people with various degrees of orthodoxy, and some may be less orthodox than those in the kingdom of Unbelief. This is to be expected, they are starting farther from the destination, who is Christ. But if we take our Lord's remarks seriously then he defines the orthodoxy the saved are heading toward, he is the pathway by which they reach their destination, and he empowers them to do the same (John 14:6). A high view of Scripture in modern times has been equated with idolatry. Inerrantists may be described as Bible worshippers; accused of bibliolatry. I know of no one that has an shrine for their Bible or burns incense to the Scriptures. I am not aware of Christians who insist that the Bible is stored above other objects in the room in the way that Muslims may keep their Koran on the top shelf. 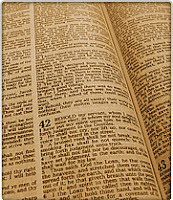 Some may prefer their particular Bibles, though that is more sentiment than worship. One may regret a family Bible gets lost in a fire, but for the sentimental person who values Scripture highly: he buys another Bible. What I am aware of is many Christians treating the words of the Bible as the words of God. But given that the authors of the Bible did the same, as did Jesus; combined with the Bible equating the phrases "Scripture says"and "God says": it would seem that treating the Bible as the very words of God is not idolatry. True, one can claim to love the Bible and not really love Jesus. I find it difficult to believe that one may love Jesus yet not love the Bible. If Scripture really is the oracles of God then minimising this truth, laying accusations of bibliolatry, and mocking of the same, would better fall in to the category of idolatry—veneration of moderation—than having a high view of Scripture. Mathcounts is a US national mathematics competition for grade/ year 6 to 8. ChristianNewsWire reports on a bizarre decision. Math Counts, a national math competition for teams and individual students in grades 6-8, will not allow homeschoolers to form teams and compete in the 2010-2011 school year. The Math Counts board unanimously decided to exclude homeschoolers in response to a few situations in which "super teams" were formed by pulling certain gifted students from public schools and labeling them as homeschool teams. So a group of public schooled students lie by claiming to be homeschooled. Presumably this is to get bright kids from different schools on the same team rather than under the banner of their school? And the decision is not to punish the dishonest public schooled children but the honest homeschooled children. Clearly the idea of banning every school which has a student claiming to be homeschooled required exceptional intellect and was not considered.